Why did O’Flaherty plant boiled potatoes? I was excited when I acquired a copy of the Ayer’s American Almanac. Not only was it published in Lowell, Massachusetts, the ancestral city of my Roane clan, it’s the 1859 edition, – the year my Irish immigrant couple, John P. and Mary (Hurney) Roane were married. I liked to imagined the little booklet sitting on a shelf in their home on the comer of Gorham of Summer streets. 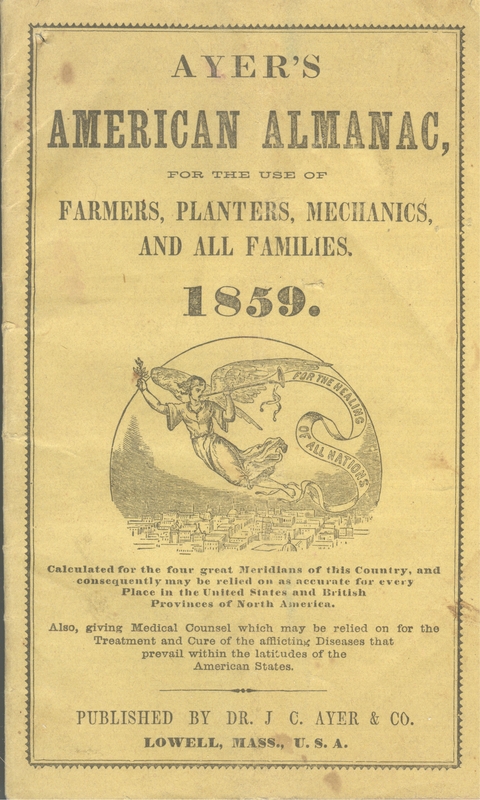 The purpose of the magazine, “For the health of All Nations,” was trumpeted by an angel on the cover. Its enterprising publisher, “Dr. James C. Ayer, Practical and Analytical Chemist,” had equal interest in promoting his financial health. Lengthy articles describe the powers of Ayer’s Compound Concentrated Extract of Sarsaparilla, Ayer’s Cathartic Pills, and Ayer’s Cherry Pectoral, to ease everyday complaints, and to cure virtually everything from deafness, partial blindness, fits, paralysis and tumors – to gout and syphilis. The booklet measures 4 5/8 by 7 inches. Despite the relentless advertising, the almanac had practical utility. The annual calendar incorporated the Christian observances of Epiphany, Lent, Easter, Trinity and Advent. It listed anniversaries of national significance, such as “Franklin born, 1706” and “Battle of Tippecanoe, 1811.” And it wouldn’t be an almanac without the weather. Predictions of wind, rain, snow and temperature would have interested city dwellers and rural folk, just as we check the daily forecast. The almanac also offered amusement. Each calendar page had extra space at the bottom. Some months filled it with run-over text. Other months featured aphorisms, witticisms, doggerel – and jokes. In my mind’s eye, I’d picture John in the parlor reading aloud to Mary (who was illiterate), or to a small group of Sunday visitors enjoying a break in the work week. I’d imagine hearing their laughter and cups clinking (whether filled with tea or something stronger, I can’t say). Then after I read the booklet through, I wondered if I was wrong about the laughter. What would any native of Ireland think and feel about the following? “How much did yees ask for thim buttons?” inquired an Irish customer. “I didn’t say fifty ─ I said fifteen,” replied the honest dealer. “Did yoar fall hurt you?” said Pat to his friend who fell with his hed from a high ladder. The Irishman’s plan for casting cannon was, ─First take a hole, and then pour the iron around it. In both the Irish and the Black ‘jokes,’ ethnic speech patterns signal the low intelligence and low character of the subjects. Instantly recognized stereotypes provide the readers of the dominant culture with a good laugh. If the source of the humor is the same, – why is it only the last two retain shock value? In part, the ethnic slurs pop; but the rest of it is recognition that African Americans still do not enjoy the full-fledged membership privileges that Irish Americans have in modern society. After the Civil War, things began to turn around for the Irish in America. They fought for the Union with distinction, and earned the gratitude of the nation. Gradually, “real” Americans (white natives) became more accepting, and government jobs, – fire, police, public works, and other essential services were opened up to the Irish. In 1888, John and Mary’s son joined the US Post Office and carried letters for 40 years. This modest post, paid John F. Roane enough to purchase a house and to raise a large, family. The Lowell newspapers over decades, reported the exploits of Roane grandsons – in sports, the arts, the military, politics, and respectable Lowell society. Yet barely 20 years before his son got that post office job, John P. Roane died – and Lowell newspapers didn’t carry a word of his passing. Though a Lowell resident for 18 years, an American citizen, property owner and businessman, the Irish native’s life went unremarked. So we come back to Ayer’s American Almanac. What do its “jokes’ reveal about that period – and about our own times? I still wonder whether John Roane was angered by the characterization of the Irish in America or if being raised under English oppressors had inured him to insult. I wonder, too, whether he felt sympathy for that other marginalized people – or whether he laughed. This entry was posted in African American history, Ethnic humor, Irish History, Irish Immigrants to the USA, Lowell, Massachusetts, Massachusetts History, Roane / Roan / Ruane, social history and tagged American Almanac, Ayer's American Almanac, Dr. James C. Ayer, ethnic humor, John Roane, Lowell, Massachusetts, nineteenth century American popular culture, racial discrimination, Social history by poorirish. Bookmark the permalink.